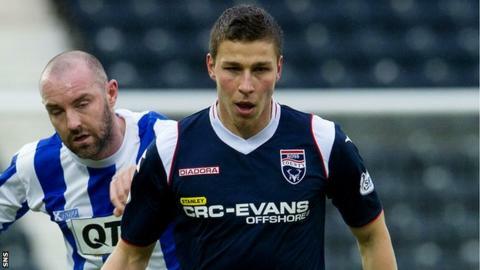 Filip Kiss would consider a return to Ross County after the end of his current loan spell from Cardiff City. The 23-year-old Slovakia midfielder is unsure of his future with the Welsh club after their relegation from the English top flight. Ole Gunnar Solskjaer has also taken over from Malky Mackay as manager. "You never know what might happen. I would love to come back because I have been treated so well here," said Kiss ahead of the final game of the season. He was one of seven signings added to the County squad in January and his six goals in 16 appearances have helped lift them clear of relegation trouble. The Dingwall outfit have secured a third season in the Scottish Premiership ahead of Saturday's trip to face Partick Thistle. "I'm just focused on the last game with County," said Kiss. "After that, I have to go back to Cardiff, so we will see what happens after that." Kiss wants to repay manager Derek Adams and the rest of the County coaching staff for the faith shown in him by helping them to finish as the best of the bottom six. "I've got a real connection with this club," the midfielder added. "They have treated me well and I've enjoyed my time here. "It is completely different to my situation at Cardiff, where I wasn't getting an opportunity. "I'm grateful for the chance to play here and it has helped me improve as a player and a person as well. Now I want to give them back as much as I can. "There is still a lot to play for as we can move up to finish in seventh or eighth, so I'm looking forward to the game with Partick." Adams was praised Kiss along with Yoann Arquin, Erik Cikos, Evangelos Ikonomou, Jordan Slew, Yann Songo'o and Michael Tidser for their contribution. "Over the season, we have had some great individual performances and great team displays," he said. "We have had players who did not start the season well but came back into the campaign. "But the players who came in last January definitely helped us. We've taken 26 points since then and that was vital."